If 2019 is your year to redesign your backyard, you’re probably researching option and pricing right now. The planning and design you invest in now pays off later when you realize your beautiful backyard and enjoy the easy process it was to achieve the dream. What are you willing to maintain? Some landscape features are easier to take care of than others. 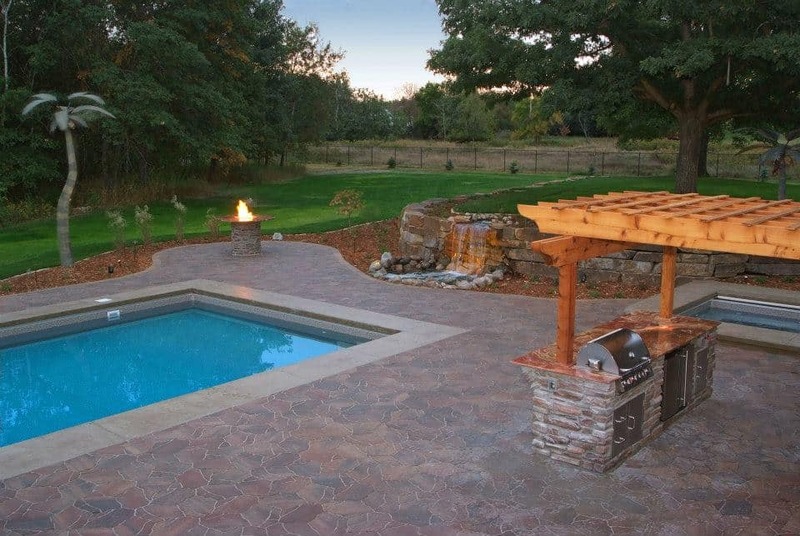 For example, a paver pool deck is a more durable design than stamped concrete. The individual pavers move without cracking in our climate. If one paver should “pop”, it’s a simple fix to reset it vs stamped concrete that tends to crack and buckle. What’s the purpose of your landscape? If you want a place to relax, then you might want a large patio space for lounging and a fireplace. An outdoor kitchen with built-in cupboards makes entertaining a breeze. What’s your design? Planning your space upfront with a well-thought design is critical in getting an accurate estimate and in making your backyard transformation a simple process. Outdoor Innovations offers free design services. To schedule a time to talk, contact us today. We look forward to helping you with your backyard transformation. 2019 is the year to “make your neighbors jealous”!